This is a really minor suggestion but I think quite a few people would appreciate a little change like that. So, here's the thing. 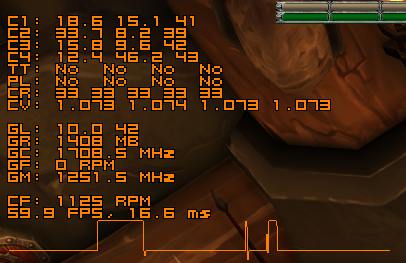 I use HWiNFO along with RTSS to monitor things while in-game, I have all the paramteres grouped with each other - a group for CPU stats, a group for GPU ones, and a group for fans. Separating those is easily achievable by setting them to use specific "lines" in OSD settings inside of HWiNFO. What is not achieveable though is separating what HWiNFO adds to RTSS OSD from what RTSS OSD does itself - FPS and frame time graph. So, I want to actually be able to put an empty line after my fan group to make a cleaner look. Current time: 04-23-2019, 03:37 AM Powered By MyBB, © 2002-2019 MyBB Group.